The leading choice for happy cats! CAT LEADER® is a natural range of classic, ultra compact clumping and silica gel cat litters of excellent quality. Characterized by superb liquid and odour absorption, CAT LEADER®’s range of cat litters is designed to offer top hygiene and utmost comfort to your cat. CAT LEADER® Classic, with its exceptionally high absorption rate and special odour neutralizing properties, lasts longer than regular conventional cat litters. 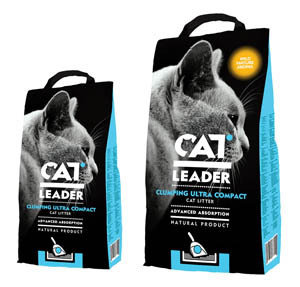 CAT LEADER® Clumping ultra compact is super absorbent and quickly forms strong clumps that are easily removed, leaving the rest of the cat litter fresh and clean for much longer. CAT LEADER® Crystals is a premium silica gel cat litter. It is lightweight, non-tracking and offers easy maintenance. The millions of tiny pores ins each granule’s surface instantly absorb all liquid, keeping the litter dry for a longer period of time (1 bag=1cat=1month). 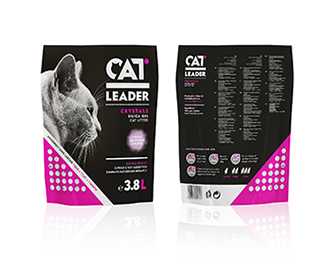 CAT LEADER® cat litters are available in 5kg and 10kg bags and 3.8L for the Crystals and with exciting Wild Nature or Fresh Lavender aromas that enhance their performance in providing optimum hygiene for your cats.